October 20, 2012 0 comments on "Dry Ice Pumpkin for Halloween"
This is a fun little pumpkin trick for Halloween. Unfortunately, however, it doesn’t last for long so you will want to save this for Halloween night. 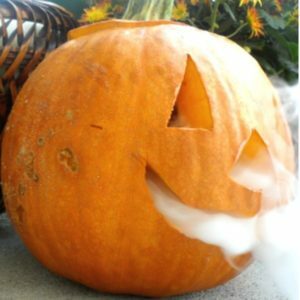 You will really impress your trick or treaters with this smoking DIY dry ice pumpkin! First of all, if you have never handled dry ice before, you might want to read up on how to handle dry ice. It requires special storage, and you cannot handle it with your bare hands. Dry ice is not like regular ice. It does not melt, it just dissipates into the air. You cannot store it in your freezer because as the dry ice dissipates it will build up gas that could potentially cause an explosion. It is also so cold that it can actually cause your freezer to shut off! Dry ice is best handled with gloves. You can store it in a container that is not completely airtight, such as a styrofoam cooler. Dry ice will last less than a day before it completely dissipates in the air, so you will want to get it the day you want to use it. Some grocery stores sell dry ice…you might have to ask around. I found some at a local Cash and Carry wholesale grocery store. They store it in a special freezer, separate from other frozen food. 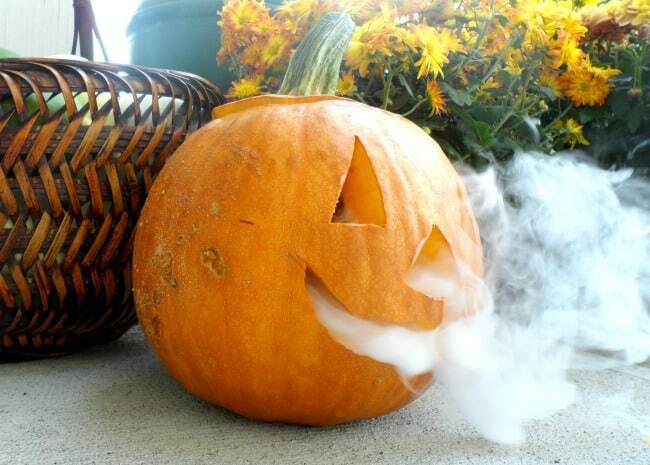 To create a smoking effect, place a small cup filled with water into your carved jack-o-lantern. 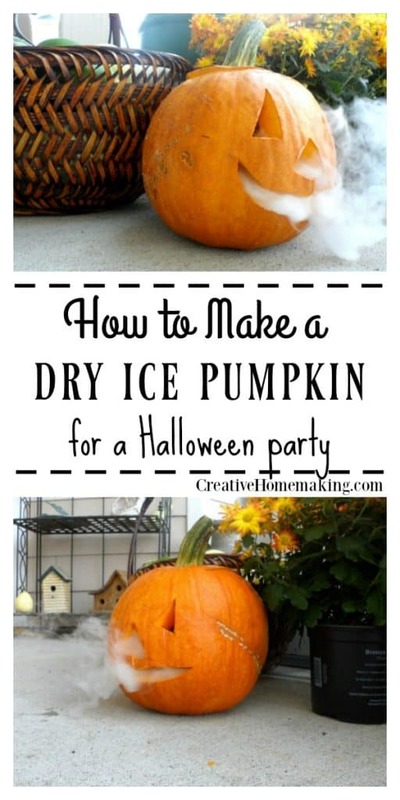 Using gloves, place a small piece of dry ice into the cup and put the lid on top of the pumpkin. That’s it! Your pumpkin will smoke for several minutes. You will have to keep adding dry ice for the effect to last for a longer period of time. You have to try this at least once. Your kids will love it! Like this article? Try my candy corn painted pumpkin. Follow my fall or Halloween boards on Pinterest.